The Academic Quadrathlon was conceived as a contest to test Animal Science students and Animal Science programs. Each year teams compete from universities around the country to represent their school at regional contests. This four part contest is designed to test the collective knowledge of the students over anything they might have learned as an animal scientist, and as such is much like a comprehensive exam. Students choose teams of four to compete on a written exam, an extemporaneous presentation, a quiz bowl and a hands-on practicum test. Questions can be from any species and any discipline. The highest scoring team has an all expenses paid trip to the regional contest which is held in conjunction with the regional meetings of the American Society of Animal Science. The local competition for the University of Missouri is held each spring semester. The winning team then represents the University of Missouri at the Midwest American Society of Animal Sciences competition. Specific details regarding the local competition are announced early each spring semester. The concept of the livestock judging team is to train individuals to distinguish differences in multiple species of livestock. However, the beneficial value of involvement goes much further than determining the compositional and quality differences of livestock. Students involved with the livestock judging program develop life skills that they utilize regardless of their occupation later in life. Team members must be able to make rapid, logical decisions and be able to defend them via oral reasons. In return, students improve their ability for critical thinking and accurate communication. In addition, students become organized and self-disciplined, learn to accept criticism, develop self-confidence and become leaders. In many cases, success in livestock judging competition translates to employment opportunities, internships and scholarships. Furthermore, relationships among team members and coaches help students better interact with others. Bonds that are developed are cherished for a lifetime. This provides a sense of family and community within a large campus. The University of Missouri Livestock Judging Team competes in several contests each year. Students with an interest in livestock judging should consider enrolling in An_Sci 2115 Livestock Judging in the fall semester. For more information, contact Ty Peckman (tepxb6@mail.missouri.edu) or Dr. Bryon Wiegand (wiegandb@missouri.edu). The University of Missouri Meat Judging Team has been a time-honored tradition for well over half a century. The first team formed in 1948 and now, 69 years later, the Animal Sciences Division at MU continues to find elite individuals to participate in competitive intercollegiate meat judging competitions. The team travels across the United States to university and industry facilities for practices and contests while enjoying stops at historical landmarks and livestock events along the way. The Meat Judging Team at the University of Missouri strives to educate students about the industry and give students an opportunity to learn and network outside of the classroom. Over the years, numerous judging team members have gone on to work in the meat and livestock industries representing both the university and meat judging program. Students interested in the Meat Judging Team should consider enrolling in An_Sci 3275 in the fall semester. For more information, please contact Ty Peckman (tepxb6@mail.missouri.edu) or Dr. Bryon Wiegand (wiegandb@missouri.edu). Animal Sciences students are encouraged to participate in an off-campus internship during their time at Mizzou. Internships allow students to gain professional experience prior to graduation, expand their resumes, and gain a glimpse of what career opportunities are available with a degree in Animal Sciences. As an Animal Sciences student, you can receive credit for your internship (AnSci 4940) that will count towards senior elective credits. More information about how to receive credit for an off-campus internship can be found on the Internship page. 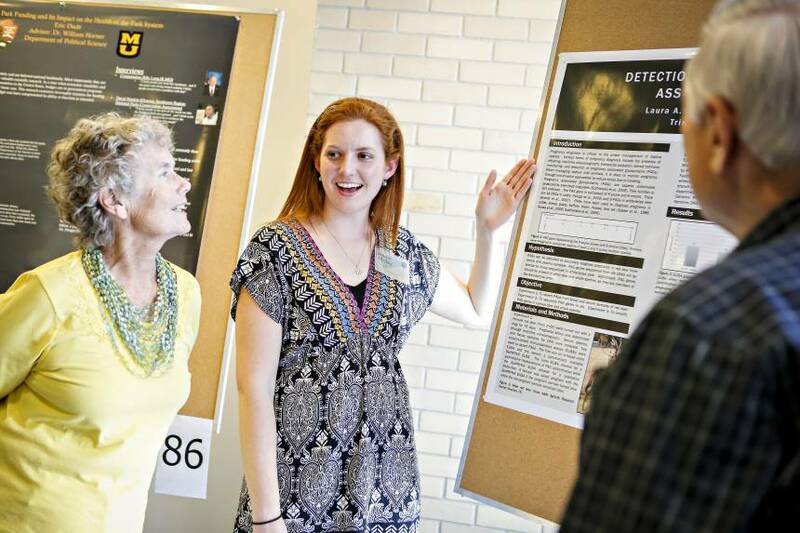 Undergraduate students at the University of Missouri shared their research in an afternoon poster … Expand ▸Undergraduate students at the University of Missouri shared their research in an afternoon poster session at the Bond Life Scences Center on the MU Campus. Undergraduate research is a great opportunity for students to explore the unknown while developing critical thinking and problem solving skills. As an Animal Sciences student, you can participate in undergraduate research and receive credit for a senior elective (AnSci 4950). Students can work side-by-side in the laboratory with Animal Sciences faculty and graduate students. Opportunities for student research can be found by reaching out to a specific faculty member or contacting the Office of Undergraduate Research. Undergraduate research opportunities may be paid, work-study or unpaid volunteer positions. Paid positions may be available through a stipend or scholarship by a faculty member or through work-study. Additionally, there are opportunities for students to participate in a research internship program with a faculty mentor for a maximum of two semesters. CAFNR offers Study Abroad opportunities all around the world and throughout the school year: Semester Programs, Summer Programs, Spring Break Programs and Winter Break Programs. Some of the Animal Sciences-focused opportunities include Australia, China, Costa Rica, New Zealand (Lincoln University), Scotland, Thailand, and the United Kingdom (University of Reading).